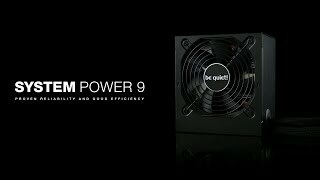 SYSTEM POWER 9 silent Power supplies for your PC from be quiet! Specially designed by be quiet! with the price-conscious PC builder in mind - the System Power 9, featuring true be quiet! reliability with two 12V-rails for rock-solid voltage stability. The series is certified 80 PLUS ® Bronze efficient and able to support multiple GPUs with up to four PCIe connectors provided.